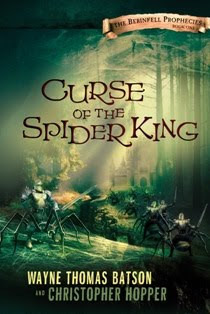 My son recently had the opportunity to read Curse Of The Spider King by Wayne Thomas Batson and Christopher Hopper. It's the beginning of a series called The Berinfell Prophecies. It's for ages 12-17 and sells for $14.99 for a hardback book. Amazon currently has it listed for only $10.19. My son is 12 and when I asked him how he liked the book, he said it was was really good, but a little confusing at times, during the flashbacks. He says it's about a group of 13-year-olds who came from another world, but didn't know it. They end up learning they are elves and are chased by an army from their old world. They also develop powers, for example, one could read minds. Some of his favorite things from the book were that the bad guys ride on the backs of spiders. He also liked a car chase, and thought there should be more. He loved all the different creatures that popped up in the book. A lot of times he would say he couldn't stop reading because it was just starting to get good. In his opinion he says teenagers would really like the book if they like mystical creatures from different worlds. It has a lot of action and draws you in. At the end of the book there is a sneak peak at the next book in the series. Mitchell says he wants to read that one too. This book was provided for free from Thomas Nelson and Mama Bzz in exchange for review. I think it is so wonderful that the boys like to read. That is so important and I instilled that in my girls when they were young. Oh what a fun book, it sounds extremely interesting. I think I may have to buy this one for the girls. I hope they turn it into a movie.